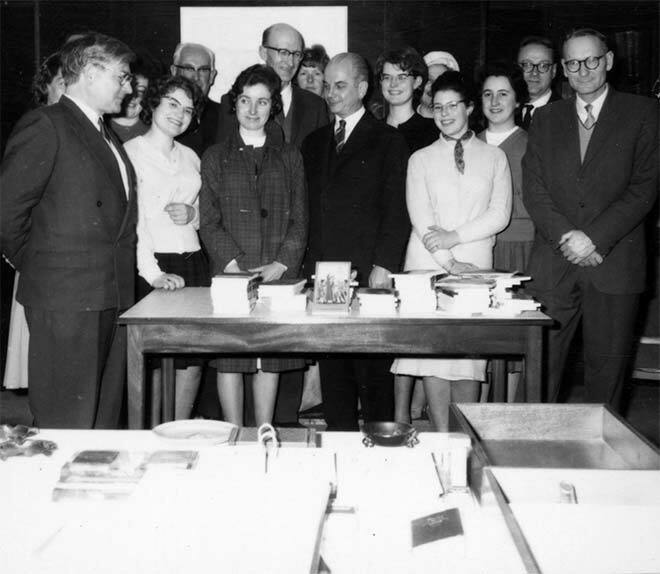 Paul Hoffmann (front left) was appointed senior lecturer in German at Victoria University of Wellington in 1959 and became the first professor in 1964. He moved to Tübingen University in Germany in 1970. Hoffmann had immigrated to New Zealand from Austria in 1938, just prior to the outbreak of the Second World War. He had completed his doctoral thesis on the Austrian playwright Franz Grillparzer but had not submitted it, and the manuscript was lost in a shipwreck during the trip to New Zealand. He became a dairy farmer in New Zealand and studied at the University of Auckland extramurally, completing a second thesis. This is Hoffmann during the presentation of some books by the German ambassador (front centre). German lecturer David Carrad is at front right.